Last week I wished for "solified connections" and I memorized the poem, Invictus, to help my little wish along. I'm pleased to report success to a degree ... and expected increased success this coming week. I wish greater healing for my mother. to participate in a 1,000 origami crane project. If you don't know the story, you can read it here. 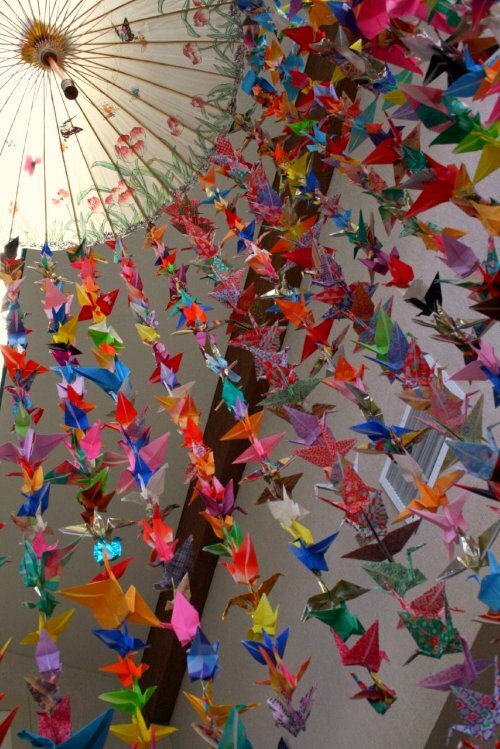 Directions to make paper cranes can be found here. If you'd like, please include a little note with a positive thought. I'll be back in Texas with my parents in a couple of weeks. I hope all 1,000 cranes arrive by then so I can string them together for my mom. Thank you in advance for participating and for promoting this to your readers. Really, blog friends, you are the best! Lots of love to you all. This is the most wonderful idea Denalee. I will be recoving from surgery this weekend and will get it sent as soon as I can! Denalee, what a thoughtful idea. Wish the best for your Mama. How beautiful and unique! You are such a hands on daughter. I hope that your Mom loves it! i've loved the story of sadako since i was little! the power of little things! I learned about this story in 4th grade and collectively, with my class, we made 1000 paper cranes. Now, I make origami mobiles that I sell on Etsy that include some cranes. I would love to help! I am wishing a greater healing for your mother as well, you are in my prayers. Big energizing hugs. This is sooooo awesome...I would love to have one of these myself!!! I am so sorry I can't send one...I will try...we have so many things in an uproar right now!!! Prayers and thoughts to you and your family!!! I wish for healing for your mother and I wish for cranes filled with folded prayers and unexpected miracles. What a beautiful project. I love it! Creative idea. I hope your response is overwhelming. Praying for you mom....what a beautiful idea. I'm gonna try and make one! What a beautiful project! I am praying for your mom! Thank you for your sweet comments on my blog - they are most appreciated! What a beautiful and inspirational project! Your mom's health is in my thoughts and prayers. awww what a wonderful and inspirational project! i love this idea of people coming together to make something soo beautiful!! Oh sweetie this is just lovely! I'm keeping you and your family in my thoughts. This is so beautiful. My prayers are with you and your mom for healing. James and I, along with some of our friends are creating cranes for you. We will be sending them next week. Our goal is at least 100. This is so inspiring! I have been telling everyone about this project! Just had to send some as well. All the best wishes to your Mom. Of course, you brought me to tears with this. You are simply amazing, Denalee! Hope I am not too late to join this dance. My girls and I will be making them this week then sending them along. This is absolutely inspirational. I just stumbled upon your blog and I think it's great. Sending your mom and you positive thoughts.